Along with my Mum & Dad I arrived at 36 ,St.Alban's Grove April, 1934 having previously lived in South London ( not far from The Elephant & Castle). Our new home was like so many of that time small. 2 bedrooms, no bathroom the bath being in the kitchen and with a wooden cover doubled as a dining table. This I'm sure felt like a palace to my parents after their London two rooms! At 46, St.Alban's lived the Jackson family, Mr., Mrs., Henry, Cyril, Gordon, Tommy and Emma. I mention this as I see from other people's memories reference to Gordon who I and others knew as "Jacko" and as we grew up he became a good mate. As well as other activities Saturday Morning Pictures at The Gaumont Rose Hill was possibly the highlight of our week. Along with another friend Len Franks we would go to the cinema on Friday evening to buy our 3d. tickets to make sure of our seats for the next morning when at last we would be in. Up with the organ from the hole in the stage and it's time for our rousing chorus - - ( ending) - Greeting everybody with a smile,smile, smile- - (many will remember that) then the films - - Great! At the time of moving to St.Helier I was 3yrs.old and at 5yrs.it was time to start school at Welbeck Road (No.8) infants, then junior where the only teacher I can remember was Miss Steel the Headmistress. At 11yrs, up tothe seniors and here I do remember names of some of the staff. Starting with the Headmaster Mr. Matthews who I think was an ex army man strict but fair, someone to look up to and I still remember him well. Also there was Miss Davies, Mr. Cook, Ellis, Purton, Agar and Mr. Birchall the music teacher who on the piano that was in his classroom would during lessons give a very good performance of "The Warsaw Concerto" among others. Welbeck was always reckoned to have a good football team and I was lucky enough to play and become captain. The year 1938 came and although I didn't know much of what was going on, something was different. We were issued with gas masks, horrible things, also large trenches were being dug on the field opposite St.Helier Hospital. 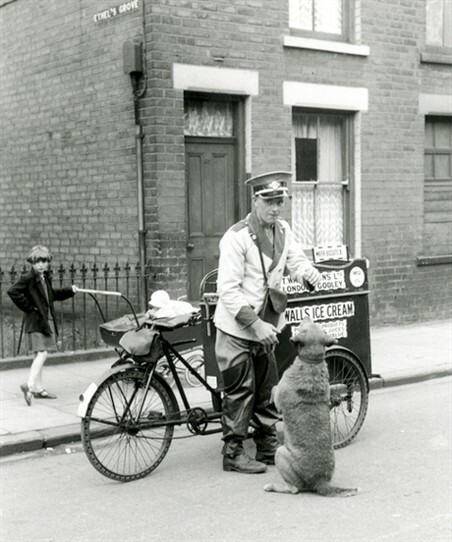 On to 3rd September,1939 and I had a better idea what it was all about ! On a sunny Sunday Morning I was out playing just round the corner in Shrewsbury Road at the same time as looking after my 2yr.old Sister when all of a sudden there was this terrible wailing noise loud and very frightening (First sirens) I ran as fast as I could for home where my Mum & Dad were asking, Where is Jean? in my panic I had completely forgot my little sister. 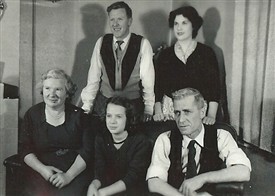 Family at 122 Waltham road . 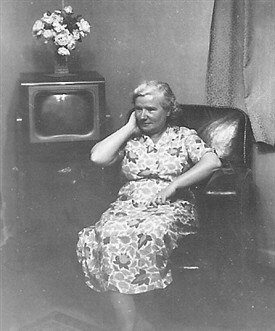 Mum so wanted a Flat Screen T.V. For the first couple of air raids(false alarms) we sat with our gas masks on but soon got fed up with that, (perhaps he wasn't going to gas us - yet!) Dad soon answered the call for volunteers and joined The L D V (Local Defence Volunteers) later named by Winston Churchill The Home Guard. His unit had their "headquarters" at one of the unused shops at The Circle. They were called out the night The St.Helier Arms was hit by an oil bomb, helping to put the fire out. During the incident Dad badly gashed his leg and when he got home Dr. Barden.was called out from his surgery in Thornton Road and he came to our house in the middle of the raid to stitch the leg up. Schooling was interrupted not just because of air raids but when we had to share schools with Green Wrythe Lane No.9 while air raid shelters were being dug. I have previously mentioned that Mr.Matthews was strict and discipline was what he required on the following occasion. Opposite us was the Jones Family and the youngest son worked at Mullards where he crushed his arm under a heavy press resulting in his death. He was 17yrs. old and was a member of the Home Guard and he was to have a military funeral. Aware that some of the pupils made their way through St. Alban's Grove to get to the school and would no doubt want to watch the ceremony which was to be around lunchtime.The school was warned that anyone back late after lunch would be punished, 79 were late and were lined along the corridor and Mr.Matthews handed out the punishment in his usual way, the stick(cane) across the palm of their hands - hard! 79 one after the other. His discipline was no doubt meant to be a deterrent, it certainly worked as far as I was concerned. In January 1941 Dad was called up into the army and served most of his time on searchlights. Meanwhile back on the Homefront in spite of the air raids us kids still had time to play. There was the trees to climb in the Grove and it was usually Jacko who led the way in "follow the leader" swinging from one tree to another, difficult to keep up with him. 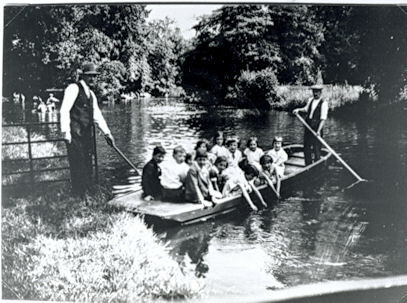 The small cul de sac was our Wembley or Lords depending on the season, and of course fishing in The Wandle and of all the usual street games. There appeared large numbers of military vehicles parked at various parts of the area this of course was part of the big build up prior to D Day. June 1944 also saw the start of the Doodle Bugs (V1s) and on the evening of the 27th one hit The St.Helier Hospital damaging the boiler house and the maternity ward, earlier in the day my Mum had given birth to my sister and we had an anxious time before hearing that she was ok. The V1s were bad enough but the fear of the V2 rockets with no prior warning was worse! 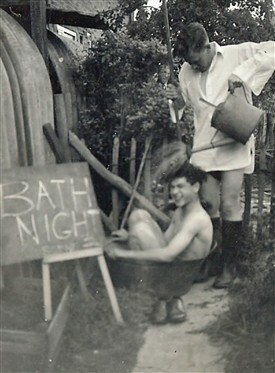 May 1945 brought VE Day With all the celebrations, big fires parties a great time! 1951 Marjie my Girlfriend now my Wife. 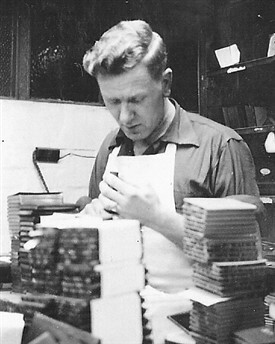 The end of my schooldays at Welbeck was approaching and at 14yrs.old on August 14th, I started work at the bookbinding firm G A Cramp & sons at Mitcham, silly as it seemed the next two days were V J Day holidays! 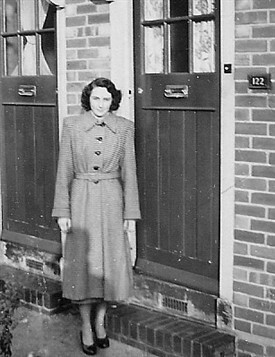 Dad being demobbed meant it was time to move to a bigger house with 3 bedrooms, so in 1946 we moved to 122,Waltham Road. 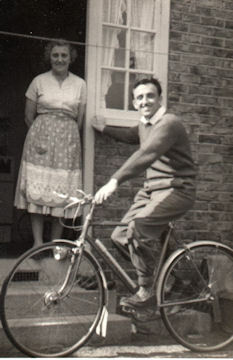 There I ended my happy 19 years at St.Helier, as in 1953 I married Marjie my present wife of 62yrs. moving to Harlow New Town. This page was added by Roy Parrett on 31/05/2015. Roy, the trenches you refer to opposite the hospital were people digging out soil to put on the top of their Anderson shelters. They were all over the place some shallower than others, then they filled with water, splashing in them was great fun until you paddled in one 3 foot deep !!!. I know, I did. It has never been referred to here by other bloggers, but the reason the facilities on this side of the estate were so basic is because the Morden side was built first, even bathrooms in the early ones, but as the depression deepened the lcc ran out of money hence the reduced standard.